Ducks getting pumped up before their Fairmont victory. Next to football, it’s potentially the most dangerous and physically demanding sport in the Oregon athletic program. The keys to being successful in this sport are trust and concentration. When launched into the air twisting and flipping, with gravity finally deciding it won’t hold this flying human airborne any longer, it is only trust in the teammates below that can ensure a soft landing. If the other fellow players fail to catch their teammate on the way back down, the results can be catastrophic. There is so much pressure to make sure everything goes according to plan, with fractions of a second to react correctly. Oregon football fans yearn for a national championship someday, and lament coming within inches of achieving it two years ago. But in this relatively new sport to the NCAA where an inch can be just as vital as on the gridiron; the University of Oregon is not only the defending national champions, they have so dominated the sport since its inception that the Ducks have only ever lost one single head-to-head match in school history. Oregon’s Acrobatics & Tumbling team must like pressure. Not only do they practice these dangerous routines on a daily basis, but the team is undefeated at 8-0, with wins against Azusa Pacific, Quinnipiac (twice), Baylor (twice), Maryland and Fairmont State. Acrobatics & Tumbling at the collegiate level is not at all how we learned to do it in grade school. Nowhere to be found are the big, colorful mats that got rolled out on the gym floor followed by everyone doing summer-saults for a few minutes or walking across a wood beam only a couple inches off the ground. Acrobatics & Tumbling is so much more grueling and physically challenging than anything that could be comprehended by whistle-blowing gym teachers. Two to four teams compete at a meet. The typical duration is roughly two hours. A meet is made up of six events: compulsories, acrobatics, pyramids, tosses, tumbling, and team routine. A halftime intermission typically takes place between tosses and tumbling. All event competition is in team rotation throughout each event. The rotation order is predetermined by the head official prior to the beginning of the meet, but the home team always performs last. Scoring is based upon pre-determined difficulty start values. Each skill performed is valued by the officials of the NCATA prior to the meet. Teams submit their skill sequences 72 hours prior to the meet. Officials perform two primary functions at the meet: They monitor the skills being performed to ensure that each element is correctly performed to equate to the posted start difficulty value. Second, they evaluate the execution and technique of the skills performed. The Ducks latest roadblock was Fairmont State (W. Virginia) and Baylor (for a second time) in two fairly close competitions. The Ducks were victorious 291.26-288.375 at Joe Retton Arena in Fairmont last Wednesday, followed by their eighth win on Saturday in Waco, TX against the Bears. With those victories, the Ducks are making a strong case for the number-one seed in the upcoming NCATA National Tournament to be held April 26-28 in Waco, TX to defend Oregon’s national championship from 2011. What makes this perfect season so remarkable is that Oregon is the only team in the league that has not lost a competition, and their remaining schedule looks to favor the Ducks finishing without a loss. The team emboldens the same philosophies as the football team in practicing as hard as they play, performing with a familiar drive and ambition to be the best team in the country, the personification of University of Oregon athletics in every sport. Against Fairmont, the two teams were tied going into the tumbling events. If the Ducks wanted the victory, they would have to produce good scores in the tumbling event to take a comfortable lead into the final event, the team routine. So as usual, the pressure was on. Instead of playing it safe, the Ducks bore down and won all of the tumbling routines, including securing perfect scores in the aerial and six-element tumbling passes. How’s that for handling stress? This marks the second straight meet that the Ducks have recorded perfect scores in the aerial and six-element tumbling passes. With those two 10’s, Oregon notched a program-high seven perfect scores, and have now scored five or more 10’s in back-to-back competitions. However, even with the tumbling sweep, in order to beat Fairmont the Ducks had to put together a solid finish on the team routine to bring home the victory. They did just that. The close final was just one more added teaspoon of pressure, something they’ve seen all season. However, these Ducks eat pressure for breakfast, handling it like it was nothing against the formidable Fairmont State squad. The aesthetic artistry of Acrobatics & Tumbling can be flashy and awe-inspiring when it is done flawlessly. The Ducks sprinkled in some flawless as they tallied a season-high 106.76 in comparison to Fairmont State’s 105.60, winning the meet 291.26 to 288.376. With that team routine, the Ducks smashed the NCATA record for team routine (106.56) and total meet score (290.56), set by Maryland on March 9th against Quinnipiac. However, the Ducks were not done competing in a neck-and-neck competition. Baylor gave the Ducks a run for their money on Saturday. Oregon’s team found themselves in a similar position following the compulsory round against Baylor on par with what they had overcome against Fairmont. They were tied for the second time in three days going into a crucial round. Oregon faltered in the pyramid and tumbling round, but won the acrobatics and toss portion to set up the 38.55-38.55 tie, heading into the acrobatic event. The tie was short lived as the Ducks tallied a 9.40 or better in all heats to take a 67.1-64.29 lead into the pyramid event. Like Chip Kelly’s frenetic offense, the Ducks Acrobatics & Tumbling crew picked up the pace in the pyramid event recording a 10.0, their only perfect score of the afternoon. They recorded 9.9 and 9.95 in heats one, two and three in comparison to the Bears’ (2-4) 9.9, 9.85 and 9.85. With a quarter of a point lead and the toss and tumbling events on deck, Oregon used the toss event to create a larger gap between the two teams, 125.6-121.94. For the second time that week, the Ducks stared pressure in the face, and knew exactly how to overcome it. These Ducks came out prepared in the tumbling portion of the meet as they won the duo pass, 9.2 to 8.6, trio pass 8.9 to 8.85 and the quad, 8.65 to 8.1. The Ducks once again secured superior tallies in the aerial, six-element and open tumbling passes to also take that round from the Bears, 56.23 to 54.41, heading into the final event, the team routine. Due to the space that Oregon created in the other events, The Ducks were able to take the team routine round, 93.31 to 89.65 to tally a definitive almost 10-point difference victory, 275.135 to 265.91 over the Bears in the venue where the national tournament will take place later this month. Team routines and tosses can be dangerous, and can potentially result in severe injury. Even with helmets and pads emerging from the Autzen tunnel looking like gladiators preparing for battle, some football players get hurt and are never able to play again. The incredible thing about acrobatics and tumbling is that these women don’t wear helmets, pads, or any protective material for that matter, yet fling their bodies wrecklessly with the same velocity as on the turf. The only protective armor these Oregon athletes wear is trust. Trust that their teammates will catch them or be in the position that they are supposed to be, something they spend countless hours practicing with more than their own fair share of bumps and bruises. As an undefeated squad, the Ducks have perfected more than just the art of Acrobatics & Tumbling; they have perfected the biggest challenge in team sports, total commitment and trust. When reading a recap of a competition, there is one element that sticks out like a sore thumb. Unlike any other sport, the one thing you won’t see in an Acrobatics & Tumbling recap is mention of individual athletes. In other sports there may be a mention of one or more Duck athletes that came up big for their team, box scores and highlights recounting the specifics of their individual efforts. Not in acrobatics and tumbling. To be successful, the whole team must play their role to be effective. In baseball (or softball) for example, if a hitter is having an 0-4 day at the plate, there are still eight other hitters that can make up for the lack of production. This sport literally takes all 44 athletes to play their specific part, whether it be an individual acrobatic performance or a member that is on the bottom of the team pyramid. If one member of the group has an off day, it will affect the rest of the lineup and the team’s point total. Now more than halfway through their season, the Ducks find themselves with a zero in the loss column. This means that they are perfect when it comes to their fundamentals and meet performances. It also means that they have perfect chemistry and every member accepts their specific role, molding them into an error-less freight train headed for the national tournament in Texas. The result of the Ducks hard work off the mat, learning to trust each member of the team, has resulted in hard work on the mat. The recipe for trust and hard physically-demanding work has resulted in the Ducks being atop the national acrobatics and tumbling pyramid with a 7-0 record. With only three meets left, they appear to be picking up speed, along with wins. These women compete in a sport that provide no protective material and can result in horrific injury. What makes them untouchable is that all 44 members of the team share something else in addition to trust. They share a ‘can’t lose’ attitude, a mantra just as powerful as Oregon football’s Win The Day motto. The 44 warriors that stare danger in the face respond with their own “bring it” attitude. 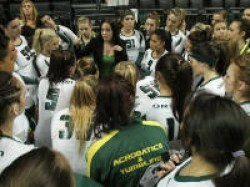 The undefeated Oregon women that make up Acrobatics & Tumbling can be described in four words: No losses. No Fear.